The remote boot Thin Client utilizes a maintenance free Thin Client architecture that can be much less difficult to use versus traditional OS based Thin Clients. The traditional OS based Thin Client is exposed to virus threats and an anti-virus approach has to be implemented for every Thin Client. Because traditional OS based Thin Client is OS based, in the case of Thin Client failure, reinstallation of the OS and drivers may take substantial time before the Thin Client is running again. Thin Client hardware obsolescence will increase the downtime before the replaced Thin Client goes on line again due to incompatible issues between the new Thin Client hardware and drivers. The remote boot Thin Client does not have storage media, does not need an operating system, and boots and loads drivers off a server. Because there is no storage media, no operating system, there is no virus issue. In case of Thin Client hardware failure, replacement can be quick and easy. IT resources are many times limited. Managing computers and workstations on the production floor can consume precious IT resources. Deploying Thin Clients on the production floor can minimize management’s time and effort. Please refer to More about ThinManager to explore the functionalities a ThinManager can provide to save time and resources managing Thin Clients and Servers. 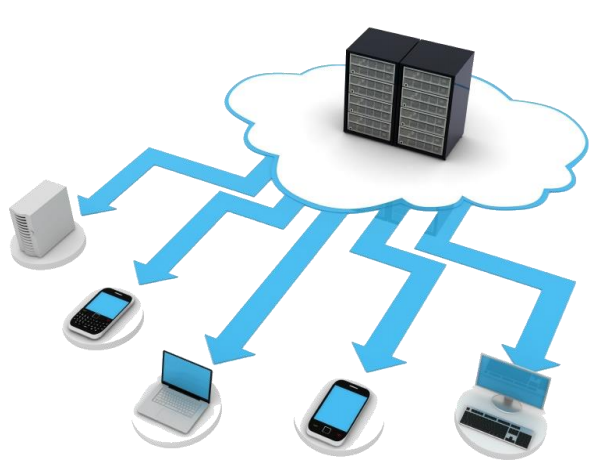 For both Client-Server and Cloud Computing architectures, processing is done in the server, data is collected in the server, often with redundant backup, residing in a protected environment. The production data is stored in protected and redundant servers. Minimize unplanned downtime and IT service disruptions while eliminating the need for dedicated standby hardware and installation of additional software. Provide affordable uniform high availability across the entire virtualized IT environment without the cost and complexity of failover solutions tied to either operating systems or specific applications.